We serve a free, home-cooked meal to the local community every Friday. Our meal is open to anyone who is hungry, and we cook for approximately 125-175 guests each week. We currently serve at ALL SAINTS EPISCOPAL CHURCH, located at 209 W 27th St, Austin, TX 78705. The church is behind Kinsolving dorm, has ample free parking in the lot, and is easily walkable from the UT campus. In order for our program to run smoothly, we rely on and value help from volunteers just like you! Our goal is to create a warm, welcoming, and dignified experience for our guests and a meaningful experience for our volunteers. We will provide service hour credit and verification at each event for volunteers. We often take photos of volunteers and post to our social media and website. By signing up to volunteer you consent to participate and authorize that any photos you are included in that are taken at the event may be posted on social media accounts or event websites. Please wear COOKING APPROPRIATE CLOTHING: long pants, close-toed shoes, hair in ponytails, and be kitchen/dining room ready! For more information, please watch the informational volunteer video posted on our Facebook page. 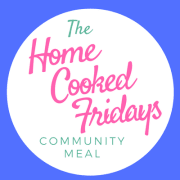 Thank you for your interest in Home Cooked Fridays. If you have any questions, please email homecookedfridays@gmail.com.